The weather here in New England has been absolutely gorgeous. We need rain, but with day time temps in the mid-60s and nights in the upper-30's I am really happy. It's nearly the end of April, and the April showers never arrived. It was a good ski season with more than the average amount of snow, so I am surprised to see water levels low along some of my favorite trout rivers and streams. So... this week the skis went down into the basement and the fishing bag and gear got thrown into the back of my van. As I mentally went through my mental check list, I recalled how a couple of years ago I did the same thing; but I forgot either my waders or my boots. Ever do that? As it turned out I did much better this year for my first day out... I only forgot my wading staff. Thankfully, the water was very manageable. Attached to the wading staff is the holster and web belt. So those items was forgotten at home, too. But the leather belt in my blue jeans provided a satisfactory alternative. 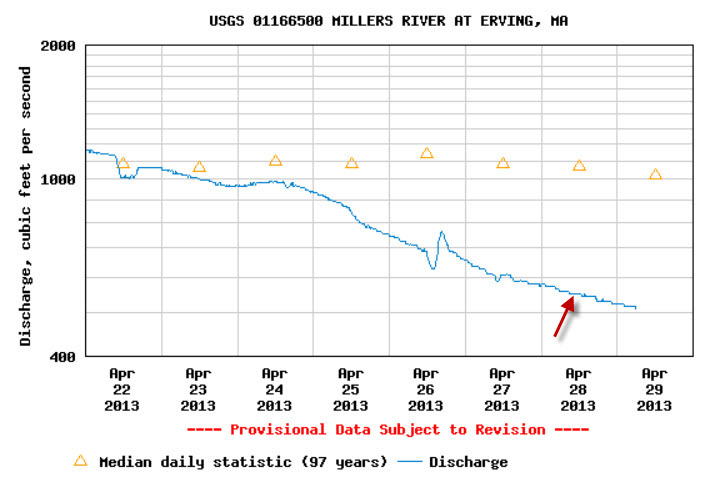 Sunday was to be the day, so on Saturday I checked the water flow on the Miller's River one more time. It was nearly perfect. I fished my favorite section, a spot way downstream, nearly to where the Millers flows into the Connecticut River. As has been the case for years, there were no fly fisherman there... though I did chat with a spin fisherman. I managed to catch four hungry rainbows. I wondered if they were holdovers, as they just seemed too thin for recent stockers. This season's first trout, a thin, perhaps 11" rainbow. Caught on a clipped peacock Woolly Worm, size 12. It is also called a Wonder Bug. The tippet is thick, at 3x, because it was very windy. Clipped hackle peacock Woolly Worm, also called a Wonder Bug, with tail of turkey biots. casting upstream. Yes, I do use a strike indicator. I fished for about 3 hours, after which I decided to drive upstream and hang out at a couple of the bridges with access to the River, in search of conversation. From the bridge in the center of Erving. Do you see the fly fisher at the edge of the pool? Just above the run in the foreground? Also taken from the bridge in Erving. Personally, I'd be nymphing in the fast water. This final picture was taken from the bridge by Orcutt pool. It was fun to lean over it and converse with a couple of fisherman, neither of which had had any luck. Taken from the bridge by Orcutt Pool. Nice pics (as always) Peter. Glad you had a good trip. To answer your question, YES, I always forget something myself. The last time out (I've been on the water 3 times) I forgot my sunglasses and was too far (read lazy)to hike back to the car for them. The pressure on the streams early in the season is the highest and I have to say, more and more fly fisherman are being encountered. In the past, if I met one other fly fisherman on the stream it was a surprise. This last trip out, there were more long rod users than spin fisherman. I've had fair success on the three trips but have caught mostly stocked fish with a 13" being my largest. Like you, I'm having most of my success subsurface but using smaller flies like zebra midges and versions of Al's Rat. How are you finding the water conditions out your way... compared with last year?